Lin-Manuel Miranda performing the opening number of "Hamilton" on the 58th Grammy Awards. 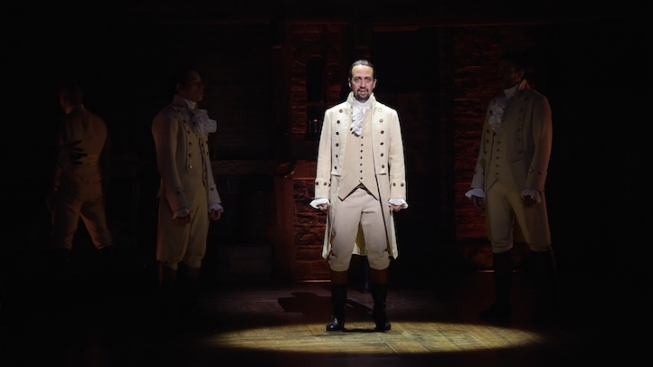 Lin-Manuel Miranda’s hit Broadway musical “Hamilton” is getting a whole new sound, thanks to an upcoming album featuring a combination of cover songs and original material by some of music’s biggest names. Queen Latifah, Busta Rhymes, Ben Folds, Regina Spektor, Common and Chance the Rapper are just a few of the artists who will appear on “The Hamilton Mixtape,” Vanity Fair reported on Wednesday. The record is expected to drop later this year. Miranda is reteaming with Roots co-founder Questlove to produce the album. The "Tonight Show" star also co-produced the musical’s Grammy-winning original cast recording, which became the first Broadway recording to ever land on the top spot of the Billboard Rap Albums charts. “I really wanted the hip-hop community to embrace 'Hamilton' because it’s such a love letter to them,” Miranda told Vanity Fair. “The Hamilton Mixtape” is a “full-cycle” moment for Miranda. After reading Ron Chernow’s Hamilton biography, Miranda originally envisioned what would become “Hamilton” as a concept album -- similar to Andrew Lloyd Webber’s “Jesus Christ Superstar,” which began as an album before becoming a show. Miranda even used “The Hamilton Mixtape” as the show’s original working title. Don’t expect to hear Miranda on “The Hamilton Mixtape” though. “I’m not going to be on it because for me the goal is to keep this inspired by the original,” he explained to Vanity Fair. For more information about “Hamilton,” visit www.hamiltonbroadway.com.